The world’s great cities are associated with many things, but one of the best ways to enjoy them? Try their signature drink. From powerful and intoxicating concoctions to more laid-back cocktails, these drinks tend to reflect the culture and character of cities they were born in. With so many venues and tipples available, it can be tricky to choose the one that best suits you. Here’s our rundown of nine of the top urban signature drinks from across the globe brought to you by Budget Direct Travel Insurance. A gin-based tonic, this recipe was first developed in 1915 by a bartender at the Raffles Singapore. It’s a light, fruity concoction with cherry brandy or liqueur, Benedictine, club soda, and lime juice. Sounds perfect for relaxing atop the Marina Bay Sands hotel after a tour of some of the city’s most interesting architecture and a stroll in the Gardens by the Bay. While all champagne is produced in the Champagne region, this opulent sparkling wine is often associated with beautiful Paris. 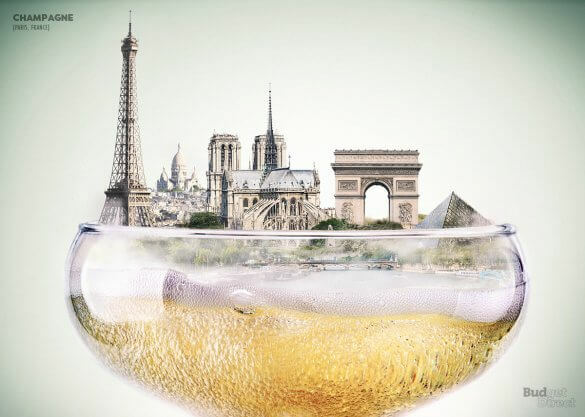 Light, bubbly, and expensive, we imagine it’s best enjoyed while dining by the River Seine and enjoying the Eiffel Tower’s hourly light spectacle. This mixture of sweet vermouth and whiskey was first knocked up in the early 1870s at the New York City’s Manhattan Club. It features a potent blend of flavours for those visiting the city that never sleeps. Ask a local to recommend their favorite lounge and leisurely enjoy a Manhattan between stops at the not-so-leisurely Statue of Liberty, Coney Island, Freedom Tower, and Central Park. Mexicans savor tequila without the salt and lime, but for those who prefer their drinks a bit sweeter, a margarita hits the spot. The classic tequila, triple sec and lime cocktail delivers a refreshingly tart taste, ideal for cooling down after a hot day of sightseeing at the modern Museo Soumaya, Catedral Metropolitana and revolution and independence monuments around this capital city. Sangria is a relatively recent creation, and it’s blend of various fruits and either red or white wine is perfect for relaxing in this sunny Spanish city. Admire the stunning Barcelona architecture – from Sagrada Familia, the Arc de Triomf and National Palace to the ultra-sleek Torre Agbar – before sharing a pitcher with your travel companions along Las Ramblas. Brazil’s national cocktail is a sweet-tasting number that masks its alcoholic potency. The primary ingredient is cachaça, which can be close to 50% proof in some areas of Brazil. Whether you’re touring Christ the Redeemer and Sugarloaf Mountain, taking in a football game at Maracana Stadium or getting cultured at the Contemporary Art Museum, a caipirinha is never far away. According to its creators, this modern concoction is high energy in a glass. The Spirit of Sydney is a pear, honey and orange cocktail, driven by a generous helping of Vantage spirit. The fruity taste is no doubt a welcome offering after a walk to see the Opera House and cross the Harbour Bridge. Known as the Spirit of Africa, the creamy Amarula liqueur comes from the marula fruit and fresh dairy cream. It’s a sophisticated looking drink, and we think it would be the perfect thing to say “cheers” to while admiring the city lights from atop Table Mountain. This gin-based liqueur is devoured by the pitcher at the Wimbledon tennis tournament – and for good reason. Featuring a secret, age-old recipe, Pimm’s has a light, fruity aroma and flavour that makes it a wonderful companion for a warm summer evening. But who says you have to wait ‘til dinner? After walking from Buckingham Palace to the Thames – where you’ll find the Tower Bridge, London Eye and Parliament Buildings – you’re sure to need a quick pick-me-up. Whether you’re soaking up the sun in Spain or bustling around London and New York, taking time to enjoy the city’s signature drink can be an experience all its own. Which drink is your city known for?